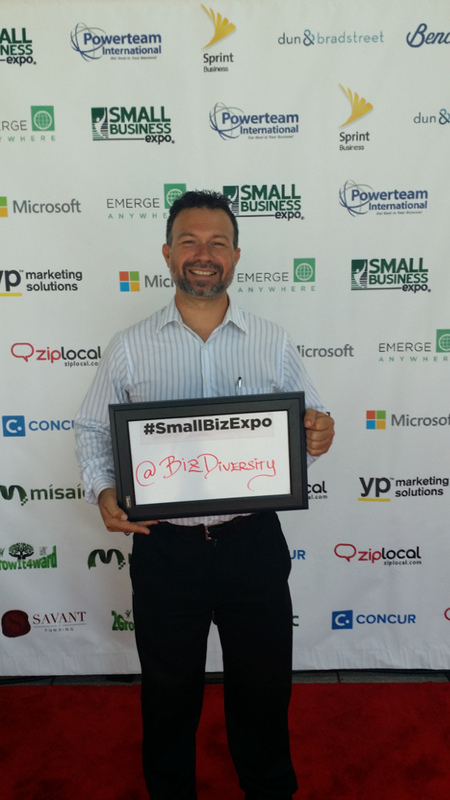 The 2016 Business Expo was very diverse, as always. Yet we noticed fewer people attending either as a booth vendors and foot traffic showing up to the event. The atmosphere remained exciting as many other companies were demonstrating and giving away free examples. There were lots more workshops and educational presentations to choose from than last year and people enjoyed most of them from beginning to end. One interesting comment from a couple of participants we met was that, even when the event was well promoted around lots of networks and media, the price or cost to participate was considerably higher from what they expected for this year – especially for smaller businesses, and we couldn’t agree more. Here is a photo of me in the event. Oh, yes I had a blast!. The majority of the vendors were out of state and mostly big to mid-sized corporations, as fewer small business owners were present this year. We would like to see more local participants and even more accessible ways for future booth vendors and co-sponsors tables. We were excited to be in touch with the SBExpo organizers whom took notes on all comments we all shared at the event. The co-organizers were very supportive and inviting. We are looking forward to seeing them all and work with them in future events. I was able to network and touch base with, and learn form, the trends in different industries and was glad to notice that no other companies providing Diversity and Inclusion services were present at this event, besides BizDiversity. There was also a shark-tank booth with opportunities for people to expose their business concepts. It was a very competitive booth, but my schedule did not allowed me to enjoy most of those presentations as I wished. I met with YP, EBA, Nextdmedia and others whom were socializing and networking as well. This was an interesting venue to share ideas and catch up trends while seeing the opportunities our whole community offers. We all left business cards and gathered a bunch. As I use to say, there is always something new to bring home from each event, and from this one we brought a lot. This is a national event all over the country you may want to consider next time for your business – they have managed marketing, branding, advertising, and community trust pretty well, and we’ll be glad seeing them next time to meet and mingle with not only mid/big size organizations executives but more with our Washington local entrepreneurs. Here is link to their website and remember to mark your calendar. Let us know if you would like to share a booth or co-sponsor a table with us in their next event here in Seattle.